The CTS is a visually striking vehicle that can go toe-to-toe with European and Japanese rivals in both performance and comfort. Available in an array of styles, with a choice of three engines, and in rear- or all-wheel-drive form, the CTS appeals to a wide range of buyers. Whether you are looking for a premium American car that stands out in the crowd or a luxurious ultra-high-performance vehicle, the CTS series will fulfill your wants and your needs. If nothing short of an import luxury brand will do, there are many exceptional alternatives from the likes of BMW, Mercedes-Benz, Audi, Lexus, Acura and Infiniti. 2012 CTS models receive a new available 318-horsepower V6 engine, three new exterior colors (Black Diamond, Opulent Blue and Mocha Steel) and standard Bluetooth hands-free phone capability. The exterior colors are also available for the CTS-V models, as well as an available blind spot warning system for the coupe model. Befitting a world-class luxury vehicle, the CTS' cabin is awash in high-quality materials - upholstered in faux leather or the real thing depending on the trim level you choose - and state-of-the-art technology. The dash is wrapped in elegant, French-stitched soft-touch material accompanied by warm wood accents and metallic trim. The available navigation display retreats into the dash, but leaves about an inch of exposed screen that serves as the audio system interface. Despite its elegant and neatly-appointed layout, the CTS' interior ergonomics could use some fine-tuning. The coupe and wagon's sloping rear roofline hinders rear-seat headroom while the center console's swept design occupies a decent amount of the driver's knee room. The 2012 CTS' athletic design is characterized by a newly refined version of Cadillac's distinctive shield-shaped grille, Cadillac's signature vertical headlights and taillights and deeply sculpted fenders emphasizing its wide, aggressive stance. Coupe models feature center-mounted exhaust outlets and a clever electronic touch pad for the doors which eliminate the need for conventional door handles. CTS-V models feature a unique front end with a satin-finished mesh grille, hood bulge and unique 19-inch aluminum wheels wrapped in Michelin PS2 high-performance tires. Through twisty two-lanes, fast freeways, urban congestion and mixed-speed suburban sprawl, we came to appreciate the 2012 Cadillac CTS' responsive steering, world-class roadholding and powerful brakes. Given its performance-based engineering one might expect a correspondingly firm ride, but we found the CTS' suspension surprisingly supple even on the most troubled surfaces. We loved the quiet cabin's luxurious design, and the multi-adjustable seats are uncommonly comfortable for long hauls. Who knew that a performance car - the CTS-V Sedan boasts a 3.9-second 0 to 60-mph time - could also provide a quiet, comfortable driving experience? The CTS-V's Magnetic Ride Control suspension system offers an impressive balance between race-inspired handling for the track and undisturbed ride quality for daily driving. The larger Cadillac CTS, however, lacks the agility of its BMW 3-Series and Mercedes C-Class competitors. Cadillac's midsize 2012 CTS is a legitimate BMW 5-Series competitor at 3-Series price. The starting Manufacturer's Suggested Retail Price (MSRP) for the sedan is just under $37,000 and around $39,000 for the coupe and wagon models. The high-performance CTS-V series checks in around $64,000, which includes the federally mandated gas guzzler tax. To see what others in your area may have paid for their CTS, be sure to check the Fair Purchase Price on kbb.com. On the resale side, the CTS should retain lower residual values than the Mercedes-Benz C-Class, BMW 3-Series and the Lexus ES 350, but maintain a healthy lead over the Lincoln MKZ. CTS-V models will retain residual values that are above those of the BMW M5, and just slightly below those of the Audi S6. The base CTS sedan and wagon variants are powered by a 270-horsepower 3.0-liter V6 driving through a 6-speed manual transmission and roll on 17-inch aluminum wheels. Inside the CTS cabin, you will find dual-zone climate controls, an 8-way power driver's seat, Bluetooth hands-free phone capability, a rear-seat/trunk pass-through for long objects and an 8-speaker Bose audio system with SiriusXM Satellite Radio and MP3 capability. Standard safety and security equipment includes six airbags, Stabilitrak stability and traction control, daytime running lights, automatic on/off headlights, programmable power door locks, a theft-deterrent system, and one year of OnStar security and convenience service with audible turn-by-turn navigation. Living in a in a chilly climate? All CTS trims (excluding CTS-V models) offer available all-wheel drive as well as an engine-block heater for those cold startups. Additional available equipment includes a sport-tuned suspension, High-Intensity Discharge headlamps with adaptive lighting to illuminate the side of the road when cornering , wood trim, a 10-speaker Bose premium audio system with a 40-gig hard drive and - get this - a live radio pause and rewind, iPod integration, navigation system with an 8-inch pop-up display, EasyKey keyless entry and ignition - the key never needs to leave your pocket or bag - and an Ultraview panoramic sunroof (not available on CTS-V or Coupe models). Prospective CTS-V buyers seeking the ultimate in comfort can opt for a set of 14-way power-adjustable Recaro sport seats featuring pneumatic adjusters for both the seat bottom and back. This sound system boasts surrealistic sound with 40-gig hard drive and iPod integration. It will download and store your CD collection, and operate your iPod or other MP3 device from the concealed USB port. The 2012 CTS lineup's available navigation system offers real-time traffic and weather, advanced voice recognition, 3-D imaging of major landmarks and an 8-inch touch screen that pops up on demand. The 2012 Cadillac CTS offers two levels of 24-valve direct-injection V6 power. The standard 3.0-liter V6 is good for 270 horsepower, while the optional 3.6-liter engine pushes output to an impressive 318 horsepower. The 3.0-liter comes standard with a 6-speed manual, while a 6-speed automatic is optional. Cars with all-wheel drive can only be equipped with the automatic transmission. Buyers who spring for the high-performance CTS-V are treated to a 556-horsepower supercharged V8, matched to either a 6-speed manual transmission or an available 6-speed automatic with steering wheel-mounted paddle shifters. Building upon Cadillac's commitment to reestablish its place as the world's standard of luxury, the 2012 CTS lineup aims to bring the fight directly to its European and Japanese competitors with a brand-new powerplant, additional standard equipment and a host of high-tech features. For 2012, variety is the name of the game. With sedan, coupe, and wagon models, high-performance CTS-V variants for each body style, and available all-wheel drive (AWD), the Cadillac CTS series is perhaps the most diverse nameplate in the luxury segment. Cadillac cts: sporty stylish American luxury. 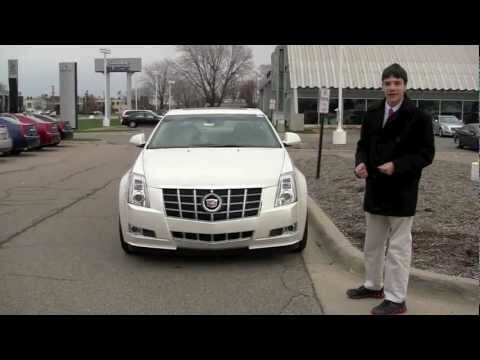 My 2012 Cadillac cts is classic and stylish, sporty and luxurious without being ostentatious. It drives like a dream and is very comfortable. I love the supportive, bolstered leather seats. If you like plush, cushy seats, this is not the car for you. Do not get me wrong, the seats are very comfortable. I needed the support and this fit the bill. The premium model has many creature comforts. I am kicking myself for forgetting the air cooled seats during this recent summer! What a cool feature! I love that I can just get in and go since there is a key fob and everything is set it and forget it. Power seats that remember your positioning, automatic lights and windshield wipers. Like I said, I just get in and go. Then I park and go about my business. I never have to hunt for my keys in my purse. Love it! The cts 3. 6 has a lot of power, I recommend that over the lower level luxury model. I never want for power entering the highway or taking off. I hit the gas and go! I have no fear. You can use premium or regular gas; she'll run on either with pretty much imperceptible impact to performance. Of course premium is best, but you will not miss much if you do not use it all the time. Just add it once in a while. Baby loves to roar and she does seem to perform a tiny bit better on premium. She's not a gas guzzler but she's no lightweight either. Mileage is somewhere around 25-26 mpg highway. The cts has been amazingly reliable. I bought mine used with less than 25k miles on it. Best car purchase ever! I highly recommend it! My car is a 4 door Cadillac. Year 2012. It is a six cylinder vehicle. The seats are not as comfortable as other Cadillac's I have owned. There is too much road noise. I have never had road noise in a Cadillac. I can not see out of it very well. There are too many blind spots. The car handles very well and responds to command very well. I am not satisfied with the gas mileage. I only get 14. 6 miles per gallon. This is a six cylinder car. I realize it is a larger car but still think I should get better mileage. For a luxury car it is too low to the ground. It is also hard to get in and out of. I do like the look of the car. I love the sleek look of the back end. You can set the lights on auto. It drives really good on the highway but if anything goes wrong with the car the parts and labor are expensive!! It's not all that bad on gas either but we use it everyday because it's our only vehicle. It's got heated seats and you can even set the driver's seat the drivers side mirror and your favorite radio station with the push of a button! It's definitely not a car you want to cruise around in. Its fast! Faster than I expected!